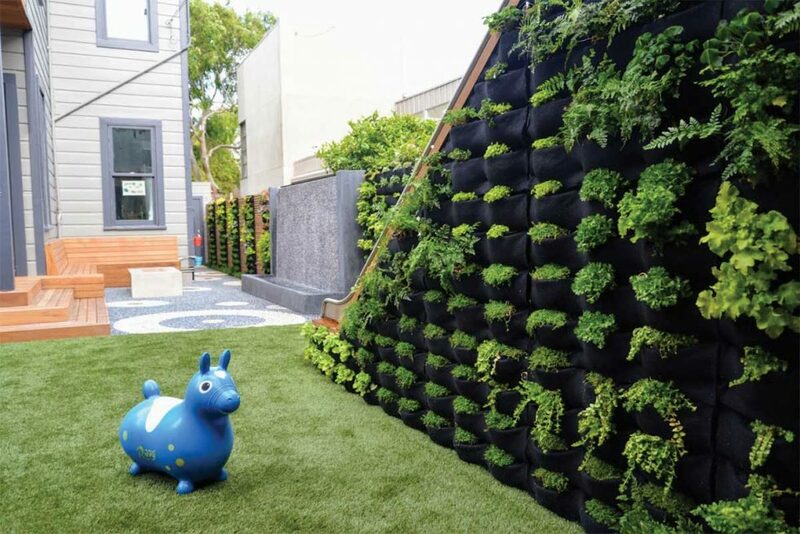 Florafelt Pockets vertical garden on a children’s slide for a San Francisco backyard by Monica Viarengo. I’m extremely passionate about your system and believe it to be the industry standard. Not the exception. We have used the slit felt plant wall system and really like Florafelt much better. So easy to change plants with Florafelt. Slit system is a big mess to change or remove a dead plant. You have to dig out the dirt and the roots and it kills the plant. With Florafelt you just pull out the root wrapper with the plant and soil contained and move it or shake it out and replace it, so easy. It’s such a cool system. It’s just simple and ingenious. We first tried Florafelt 4 years ago and tried others. Florafelt is definitely the best for the long haul. I researched lots of plant wall systems. Florafelt is the best. The plastic box types looked more complicated and not ecological. Florafelt makes sense. I have done a lot of research both online and in person, looking at plant walls in airports, etc. I like Plants On Walls concept the best, user friendly with the felt pockets, much better than the plastic boxes. Looking forward to installing my first wall. Florafelt is a wonderful system, better than the rest. It created an acoustical sound barrier for our loud concrete patio. I love how open and friendly your company is. You were the only ones who were willing to take the time to educate me on your products and their uses. I ordered 4 of the 12-pocket vertical planters a few weeks back. I’ve got them installed and (mostly) planted out and they’re working beautifully! Definitely exceeded expectations.